On April 2, the United Nations Security Council resolved to resume the phased withdrawal of the UN Mission in Liberia (UNMIL). The decision highlights the Council's confidence in Liberia both to continue the remarkable job it has done in rolling back Ebola, and to build on the progress made since the deployment of the peacekeeping mission at the end of the civil war in 2003. In March, the Liberian government approved a detailed security transition plan that will enable the country to assume full responsibility for all facets of its security by 30 June 2016, the deadline set by the Security Council. Prepared in close consultation with UNMIL and other stakeholders, the plan sets clear benchmarks for Liberian authorities to take over all security responsibilities still performed by UNMIL -- such as providing a presidential guard and safely disposing of unexploded ordnance from the war. The plan is closely linked with UNMIL's own drawdown, but it is less about replacing the UNMIL presence and more about addressing the challenges of maintaining security, peace and access to justice in post-war Liberia. For the security transition plan to succeed, the Government must consistently prioritize security sector and rule-of-law reforms throughout the 14 months remaining until the handover deadline. President Ellen Johnson Sirleaf is fully committed to the transition, and made sure that justice and security issues were included in the nation's post-Ebola recovery plan. The security challenges triggered by the epidemic in July and August last year were indeed immense, ranging from responding to social unrest and enforcing curfews and checkpoints, to cases of Ebola among Liberia's uniformed ranks and the risk that Ebola would enter its overcrowded prisons. The virus, which killed more than 3,000 Liberians in 2014, quickly overwhelmed the healthcare system and triggered profound adverse economic, social, political and security reverberations. The Security Council recognized the unprecedented extent of the Ebola outbreak in Africa as a threat to international peace and security. Community support is vital to the security transition plan. The horrors of Ebola exposed the lack of progress in bringing effective services to most Liberians. A silver lining of the Ebola crisis, however, was the initiative communities took in beating back the virus. While Ebola may initially have reinforced communities' mistrust of outsiders and the Government, over time the crisis helped to develop cooperation within and among communities as collective effort was required, including to locate and isolate those possibly exposed to Ebola across large areas. With strong support from international partners, the Government stepped up its response. A recent study verified that the authorities became a credible source of Ebola information. After communities accepted that Ebola was real, people became attentive to the life-saving messages on prevention disseminated across the country by UNMIL Radio, community radio stations and other forms of outreach. A successful security paradigm after the UNMIL drawdown requires at least the same degree of community involvement, consultation and cooperation that resulted in Liberia bringing Ebola to the brink of elimination. 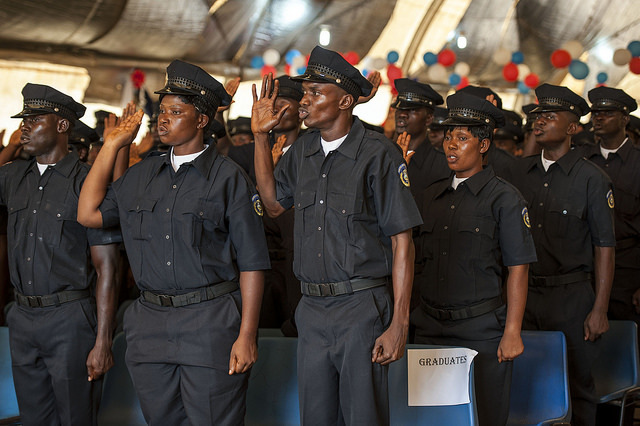 It is essential that more justice and corrections personnel be deployed outside of the capital, Monrovia. But numbers aren't the whole story: the police and judiciary can be effective only if they earn and enjoy the trust and cooperation of communities. Throughout the transition, UNMIL and its partners will continue to play their part by supporting the Government to strengthen its security capacities and move forward critical processes fundamental to long-term peace and stability, including security sector reform and, critically, national reconciliation. 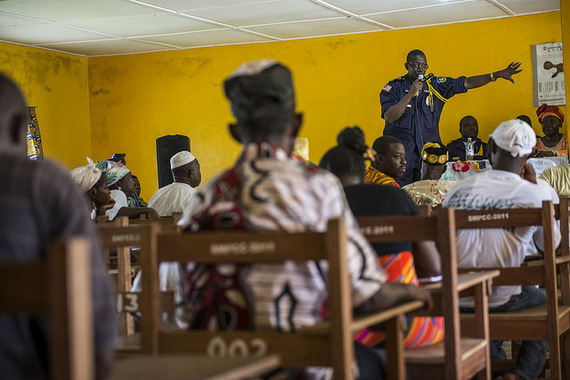 Ahead of the next UNMIL military departures in May and June, UNMIL personnel will join Government-led town hall meetings across Liberia to address the concerns of the public, and convey the message that communities themselves need to do their part to maintain public order, as they have also done in the past. Peace has prevailed in Liberia since 2003, through the draw down of peacekeepers from 15,000 in the aftermath of the civil war. By the end of September 2015, the number of military personnel in UNMIL will be 3,590, in addition to just over 1,500 UN police. UNMIL's transition is more complex than pulling out and handing back specific security tasks, and I regularly ask Liberians to reflect on outstanding issues that they would want to see addressed while peacekeepers remain in their country. It is incumbent on Liberia's leaders and people to use the remaining presence of peacekeepers to address, as far as possible, the root causes of Liberia's fragility. 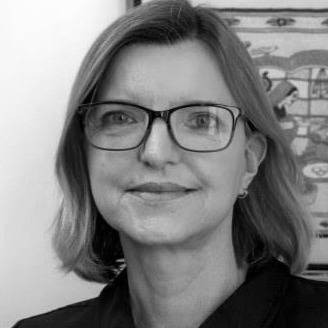 Landgren's next post will look more closely at the Government's priorities in the run up to the 30 June 2016 deadline for completion of the security transition.